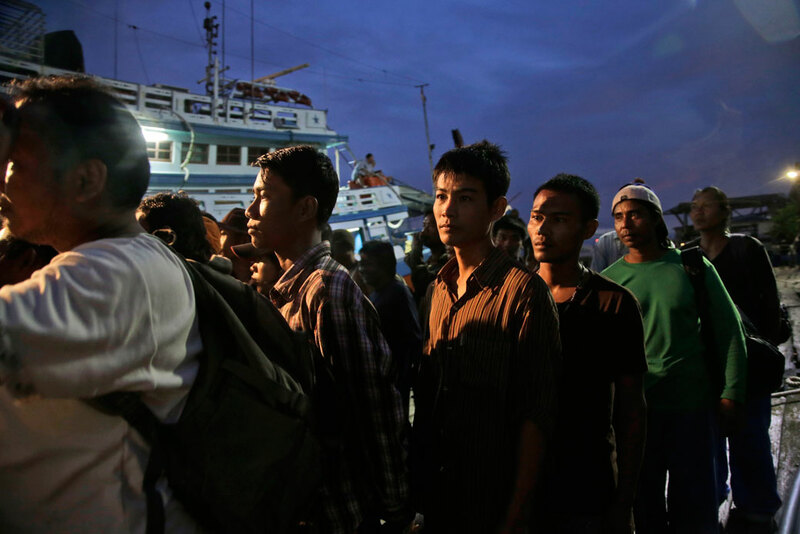 Burmese fishermen prepare to board a boat during a rescue operation in Benjina, Aru Islands, Indonesia, April 3, 2015. Recent media investigations have revealed regular use of forced labor in the international seafood supply chain. Here’s how the U.S. government and the private sector should respond to curtail these abuses. Until recently, there was little mainstream interest in the manner in which imported seafood is caught and transported to the United States. Unlike the garment sector, which for decades has been dogged by accusations of dangerous working conditions and abusive practices in its overseas supply chains, criticism of labor issues in the food industry has largely focused on the conditions of domestic workers in fields, on farms, and in processing plants. Over the last two years, however, a series of groundbreaking investigations by news organizations and advocacy groups exposed horrific treatment of laborers aboard commercial fishing vessels and at aquaculture sites and seafood processing plants in Southeast Asia. The rising interest in confronting illegal and inhumane practices in the seafood industry—especially through bipartisan congressional measures—provides cause for optimism that the United States and its international partners can cooperate on an effective framework to eliminate labor abuses from seafood supply chains. Measures that improve the sustainability of global fisheries through enhanced accountability and transparency—for example, by establishing a mechanism to trace seafood as it moves through complex and often confusing supply chains—can also strengthen efforts to identify and counter human trafficking at sea. Yet optimism by itself will not end seafood slavery. The complexity of the global trade in seafood products and the diversity of actors participating in the fishing sector mean that only a sustained, coordinated effort across major seafood importing and exporting nations and private industry is likely to produce a lasting solution. This report examines how the federal government can coordinate more effectively across agencies and with the private sector to address seafood slavery. It finds that current approaches to dealing with the global challenge of human trafficking are ill-equipped to deter and punish the mistreatment of seafood laborers and that only a cross-cutting, interdisciplinary approach that situates seafood slavery in the wider context of lawlessness at sea is likely to make inroads against the problem. It also finds that key laws designed to fight human trafficking and IUU fishing are being enforced in an unnecessarily narrow and compartmentalized way. Ending human rights abuses in the seafood industry will require greater information exchange and cooperation across agencies—particularly between the National Oceanic and Atmospheric Administration, or NOAA, and law enforcement and customs authorities—and partnerships between the U.S. government and the private sector and civil society that leverage technological innovation to strengthen the global response to seafood slavery. Significantly, there is evidence that the depletion of global fish stocks has correlated with the rise in seafood slavery. Unregulated and illegal fishing tends to deplete nearshore fisheries, causing fishing fleets to travel longer distances for their catch, which in turn results in higher fuel and labor costs. Even a small increase in the cost of labor can significantly increase the cost of production, leading some fishing companies to take drastic measures to stay competitive.15 Without enforcement and oversight, labor costs are the easiest to cut from the equation, creating an incentive for modern slavery. 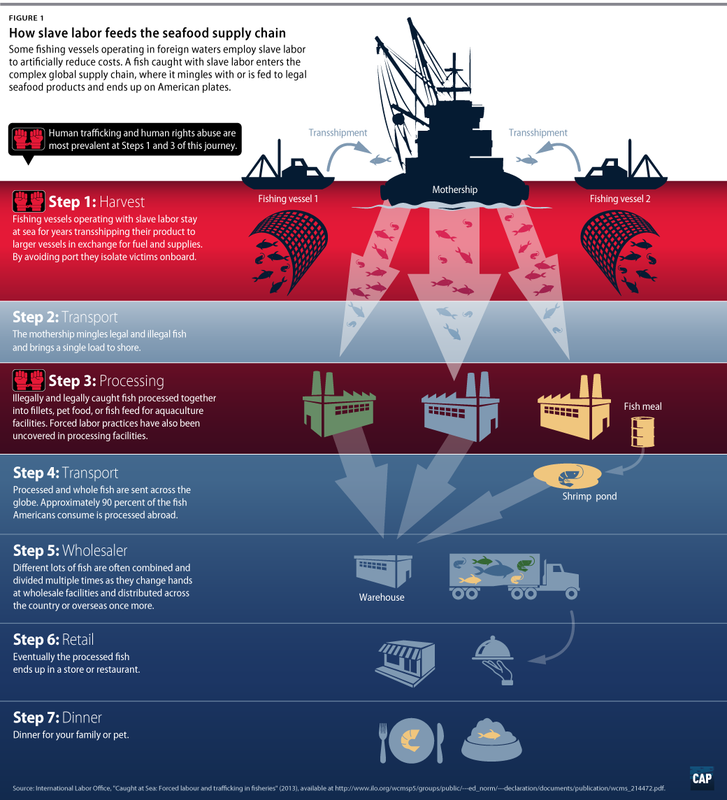 As fleets travel further from regulated waters, moreover, it becomes easier to engage in labor abuses without detection. Advances in long-distance transportation and rising consumer demand have transformed the seafood industry into a complex, globe-spanning web of producers, shippers, and importers that bears little resemblance to the iconic yellow-capped fishermen of earlier times. Between catch and consumption, an individual fish can pass through several middlemen and travel thousands of miles. After harvest, fish are returned to port and often comingled with thousands of other fish from different vessels. Next, the fish are placed on ice and trucked to a primary processor, which will fillet, debone, and freeze them. The altered product, now labeled as originating from the country where the processing plant is located, is then exported to a wholesale facility or, at times, to a secondary processor for further refinement into products such as fish sticks and pet food. The wholesale facility, in turn, sells the product to a wide array of buyers, such as grocery stores and restaurants, or, potentially, a secondary distributor. In some cases, the product is even re-exported. Popular aquaculture products such as shrimp or salmon are involved in even more complex supply chains. These chains begin not with the consumed product itself but rather the harvest of small fish that are of minimal value commercially but useful as a cheap source of feed for farmed shrimp or fish. Although these small fish—commonly referred to as “trash fish”—are an integral part of the global seafood market, the fact that they are consumed by other fish rather than by humans means that they are often excluded from supply chain monitoring. Although human trafficking in the seafood industry is a distinct challenge from IUU fishing, they share the same main drivers: weak rule of law, limited data on violators, poor coordination among international actors, and rising global demand for seafood products at an affordable price. Furthermore, the two problems are often self-reinforcing and frequently occur simultaneously. While nearly all of these abuses occur in foreign countries, they remain relevant to U.S. consumers for reasons beyond the moral imperative to combat slavery. American seafood consumers or pet owners have likely eaten or fed their pets seafood provided by slaves. Unlike most other food that Americans eat—the vast quantity of seafood consumed in the United States comes from foreign sources. Of the fish and shellfish that Americans consume each year, only 3 percent is caught or farmed in American territory, according to the U.S. Department of Agriculture.21 The United States, like much of the developed world, depends overwhelmingly on imports to satisfy domestic demand for seafood products. The U.S. market for imported seafood is the second largest in the world after Japan.22 However, in many cases, seafood that is caught in the United States, such as Alaskan salmon, is processed abroad and then sent back to the United States.23 This action increases the complexity of the seafood supply chain and means that U.S.-caught seafood may be associated with human rights abuse. Fortunately, the fact that seafood slavery and IUU fishing have common drivers means they share common solutions. Policies and innovations that increase transparency in seafood supply chains make it easier to monitor for unsustainable fishing practices and labor abuses in international waters. The same tools can help prevent seafood harvested illegally from being imported into the United States. In the same vein, initiatives that promote rule of law and protect workers make it harder for double-dealing boat operators to offset the costs of travel to remote protected marine areas by using cheap trafficked labor. One pillar of U.S. anti-trafficking efforts has been the introduction of criminal penalties for a wide range of trafficking activities. Most of these penalties relate to domestic trafficking violations—that is, trafficking committed by U.S. citizens or companies or involving victims trafficked inside or into the United States.26 But U.S. law also authorizes the prosecution of some forms of trafficking that occur abroad. Of these authorizations, the most significant is a provision of the 2008 TVPA reauthorization that bars U.S. citizens and companies from benefitting indirectly from human trafficking by knowingly or recklessly participating in a “venture” that uses or provides trafficked labor.27 This prohibition on financial benefit from trafficking means that any U.S. firm whose contractors or subcontractors engaged in human trafficking could theoretically be subject to criminal prosecution or civil liability—provided there is adequate evidence that employees of the firm knew about the abuses or looked the other way. In theory, the amended section 307 and the 2008 TVPA reauthorization could serve as powerful deterrents against the use of human trafficking in the seafood industry. In practice, however, their effect has been and will likely continue to be limited. As currently enforced, both of these authorities—and other federal and state laws with potential application to overseas trafficking—require evidence tying a known user of trafficked labor to merchandise destined for or already inside the United States. Yet the complex nature of seafood supply chains, in which a fish changes hands multiple times and is often commingled with catch from other vessels, can frustrate efforts to determine chain of custody from point of production to a U.S. port—let alone to the ultimate consumer. Given the competing institutional priorities at the Department of Justice and the Department of Homeland Security, meaningful law enforcement action against seafood slavery is only likely to occur if leaders at these two agencies agree to prioritize overseas trafficking and secure sufficient resources to investigate forced labor outside the United States. A recent civil suit brought by trafficked Cambodian laborers against major suppliers of seafood to large U.S. retailers, which survived a motion for summary judgment and is now scheduled for trial, could provide an instructive pilot case.34 If the plaintiffs prevail—or reach a favorable settlement—it will send a strong signal that seafood slavery is not beyond the reach of U.S. law. Finally, it bears noting that the Department of Justice and CBP are not identically situated with respect to punishing seafood slavery: As an enforcer of criminal statutes, the Department of Justice can only bring a case when it is confident that it can establish beyond a reasonable doubt that a specific person or company is complicit in human trafficking. CBP, by contrast, has considerable discretion in how it chooses to enforce the Tariff Act. Should the agency choose to revise the regulation currently governing enforcement of section 307—which is already outdated following the repeal of the consumptive demand loophole—it could potentially adopt a less restrictive approach to goods produced with slave labor. Law enforcement and customs are just one strand of the wider U.S. campaign against human trafficking. Foreign assistance is another key line of effort with implications for seafood slavery. Here, the United States has played a constructive and influential role in moving the international community toward a strong anti-trafficking position and in encouraging and enabling foreign governments to address human trafficking within their own borders. These activities have brought greater scrutiny to slavery in the seafood sector, but the scale of the problem demands greater mobilization of resources and more cross-cutting programming. 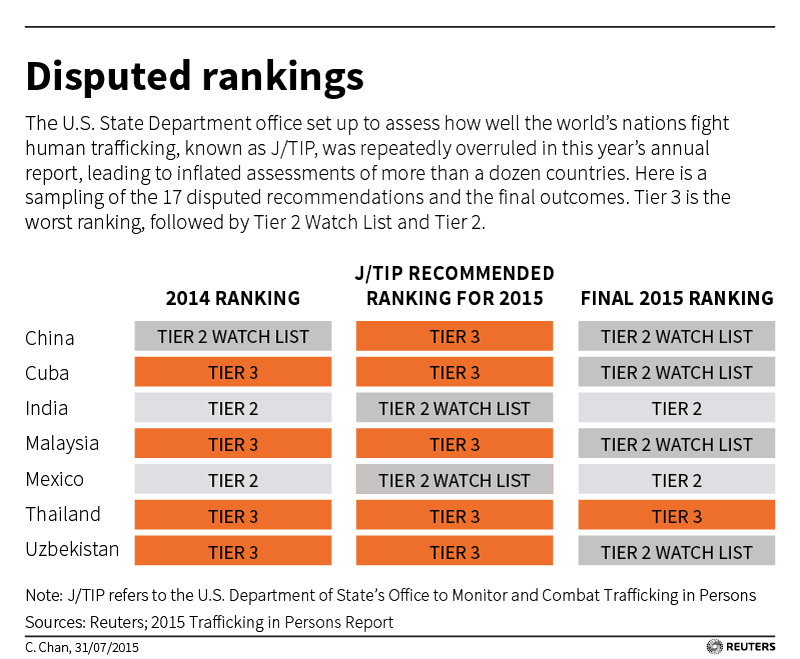 The most prominent foreign policy initiative relating to human trafficking is the U.S. Department of State’s annual Trafficking in Persons Report, or TIP Report, which sorts the world’s countries into four tiers based on their efforts to combat human trafficking.35 Countries that are assigned to the lowest tier—Tier 3—are subject to discretionary sanctions that include withholding of nonhumanitarian and nontrade aid, including advocating against assistance provided through international financial institutions such as the International Monetary Fund and World Bank.36 But the purpose of the TIP Report and the information collection that supports it is not exclusively—or even primarily—punitive. Rather, it is intended to help address the problem within a designated Tier 3 country by providing an empirical and analytic basis for a range of associated programmatic activities, such as direct state-to-state assistance to support investigation and prosecution of human trafficking and funding for both government and NGO-implemented anti-trafficking initiatives. USAID, the Department of State, and the Department of Labor each run notable initiatives to address seafood slavery, which are discussed below. In 2014, the Department of Labor’s Bureau of International Labor Affairs and the International Labor Organization’s Program on the Elimination of Child Labor joined forces to combat child labor and forced labor in Thailand’s shrimp industry. The project conducted research relating to migration, labor protection, social protection, and education in four seafood-producing provinces in Thailand.44 This research was used to increase inspections of seafood processing facilities, target capacity building for on-the-ground enforcement, and enhance access to education on the risks and rights of workers.45 The Bureau of International Labor Affairs and the International Labor Organization partnered with Thai research institutes and universities, in addition to Thai seafood associations and NGOs, for the duration of the study. This is not to say that current U.S. foreign policy is perfectly aligned with the challenge of seafood slavery. Most USAID and State Department–funded anti-trafficking projects are focused on discreet challenges inside individual countries, such as improving services to victims, building law enforcement capacity, and raising awareness. Although the President’s Interagency Task Force to Monitor and Combat Trafficking in Persons, the State Department, and USAID have all acknowledged supply chain analysis and the seafood industry as priority areas, that rhetoric has not yet translated into sufficient deployment of resources. The value of J/TIP funding for projects specifically focused on the seafood industry or on supply chains between 2013 and 2015 was less than $5 million, or 3 percent of total J/TIP project expenditures.48 Although J/TIP has increased spending on seafood to more than $2 million in 2016, this sum is still a fraction of overall U.S. government spending on human trafficking and a drop in the ocean compared to the value of the seafood export markets of countries where seafood slavery is endemic.49 In addition, there has been virtually no funding of projects focused on deceitful labor recruitment practices—a key driver of human trafficking in the seafood sector. Beyond funding limitations, U.S. foreign assistance relating to seafood slavery also suffers from a narrow focus on law enforcement and victim assistance that ignores the ecological dimensions of the problem. Weak fisheries management and unsustainable fishing practices are major drivers of seafood slavery, yet there appears to be limited if any coordination between the J/TIP office and the State Department’s Bureau of Oceans and International Environmental and Scientific Affairs—or, for that matter, between J/TIP and NOAA. USAID’s Supply Unchained initiative is, at the moment, unique in the intersectional approach it takes to understanding the causes of seafood slavery, but there is no reason its analysis and findings could not inform future U.S. foreign assistance activities focused on the seafood sector. Parallel to its efforts to end human trafficking at home and abroad, the federal government has also made a major push over the past five years to respond effectively to the persistent challenge of IUU fishing and seafood fraud. The main driver of this effort has been the Presidential Task Force on Combating IUU Fishing and Seafood Fraud, established by President Obama in 2014. Although the task force’s primary objective has been to protect global marine resources and ecosystem integrity, many of the key tools and policies it has proposed could contribute significantly to the fight against seafood slavery. Despite early signs that policymakers intended to incorporate human rights issues into a broader counter–IUU fishing agenda, the implementation of the task force’s recommendations has largely ignored labor issues. Although the task force is composed of 14 federal agencies, the majority of responsibility has been designated to NOAA. In its activities and policies aimed at curbing IUU fishing, NOAA has adopted a narrow view of its mandate that focuses only on the ecological aspects of fisheries management and illegal fishing. The Seafood Import Monitoring Program and the Trusted Trader Program could substantially enhance the U.S. response to seafood slavery in at least three ways. First, the centralized data collection procedures established under the traceability program could be expanded to collect information relating to labor conditions, such as crew manifests, suppliers’ past histories of labor law violations, and time spent at sea. Second, chain of custody data collected under the traceability program could assist law enforcement agencies in enforcing anti-trafficking laws against actors in the global seafood industry by providing a documented and reliable mechanism for tracing the movement of slave-produced goods from point of abuse to point of import. Third, incorporating some form of human rights due diligence into the requirements for obtaining Trusted Trader status, or permitting revocation of that status if complicity in labor abuses can be established through credible evidence, would create a strong incentive for major market players to scrutinize their supply chains more closely. A separate but equally concerning issue is that NOAA has indefinitely delayed the implementation of shrimp in the final Seafood Import Monitoring Program. In 2015, the United States imported 1.3 billion pounds of shrimp, accounting for more than 28 percent of the total value of edible seafood imports.66 Most of this imported shrimp originated from countries where human trafficking is highly prevalent in shrimp aquaculture and processing. The majority of shrimp consumed in the United States is associated with human trafficking. Effective monitoring of shrimp supply chains is therefore a crucial element of the fight against seafood slavery. However, inconsistent reporting requirements for domestic shrimp aquaculture—which are currently set by individual states rather than by the federal government—has raised concerns that collecting data on foreign shrimp imports would be an anticompetitive practice under the rules of the World Trade Organization. In light of these concerns, NOAA will likely need to implement uniform reporting requirements for domestic shrimp production before engaging in monitoring of foreign shrimp imports. The majority of shrimp consumed in the United States is associated with human trafficking. As the U.S. government takes strides to eliminate seafood products associated with illegal fishing and human trafficking, the private sector must also demand accountability in seafood supply chains and drive the government’s efforts forward. Private companies can influence demand for products by taking additional steps to unveil all the steps behind the production and transportation of those products. On the sustainability side, ecolabeling or certification programs, such as the Marine Stewardship Council certification and the Best Aquaculture Practices certification, have been used to assure consumers that a product is legal and sustainably harvested.72 Walmart has vowed to purchase only fish that have been certified by the Marine Stewardship Council, which certifies sustainable fisheries and has also stated that “companies successfully prosecuted for forced labor violations shall be ineligible for MSC certification.”73 Other major grocery chains such as Whole Foods and Wegmans use software tools such as Trace Register to fulfil their mission to only source sustainably and legally caught seafood products.74 In most cases, however, retail outlets have spotty information about their supply chains and the origins of the fish. Seafood slavery is a complex transnational problem that threatens both human rights and ocean ecosystems. As such, this problem demands an integrated whole-of-government solution. In order to have maximum impact, U.S. policymakers will need to leverage existing tools in new ways and break down silos across agencies and departments. They will also need to identify more opportunities for partnership with the private sector, especially as the deployment of new technologies makes it easier to monitor for human rights abuses at sea. One crucial component of this integrated approach should be diagnosing the main drivers of seafood slavery and how they intersect with IUU fishing—a problem that has already received much greater scrutiny and a far more sophisticated international response than seafood slavery. Below are some recommendations designed to advance these goals. Greater transparency. The Department of Justice and CBP should disclose how many investigations they conduct each year pertaining to human trafficking in U.S.-bound supply chains. In addition, CBP should disclose how many petitions it receives each year relating to alleged violations of section 307 of the Tariff Act and the frequency with which these petitions result in an enforcement action. Increased resources. To date, the Department of Justice has not conducted any prosecutions relating to human trafficking in U.S-bound supply chains. Furthermore, CBP has taken enforcement action under section 307 only four times in the past 15 years, all of which related to items produced in Chinese prisons. Both agencies should examine whether current funding levels are adequate to support investigation and prosecution of human trafficking violations occurring abroad that fall within the scope of the Tariff Act or TVPA. New approaches to enforcement. CBP will need to revise the current regulation governing application of section 307 in light of the closure of the consumptive demand loophole. This regulatory exercise offers an opportunity to re-examine whether the agency’s existing procedures are flexible enough to account for the complexity of modern supply chains. In particular, CBP should consider whether certain circumstances justify shifting the burden of demonstrating compliance with section 307 to importers—that is, requiring firms seeking to import goods from a high-risk sector, such as Thai seafood, to demonstrate the steps they have taken to ensure they are not sourcing slave-produced merchandise. In addition, CBP should clarify whether section 307 extends to forced labor in the transportation of goods, as distinguished from the conditions of their production. Recent U.S.-funded or programmed foreign assistance activities aimed at curbing labor abuses in the seafood industry or in U.S.-bound supply chains have achieved meaningful impact on small budgets. However, the size of the seafood industry and the scale of abuse justifies more aggressive intervention. Although there are many manifestations of human trafficking that deserve the attention of U.S. policymakers, few are as ripe for innovative and creative solutions as seafood slavery. The annual TIP Report has established the United States as a global leader on human trafficking issues and has served as an invaluable tool for advocacy groups seeking to pressure foreign governments to take action against labor abuses, including seafood slavery. However, recent allegations that political considerations have influenced country rankings—in particular, Thailand’s upgrade out of Tier 3 despite the persistence of seafood slavery on Thai vessels—threaten to undermine the value of future TIP Reports as an advocacy tool. To ensure that the TIP Report continues to be regarded as a credible and objective source, the Office of Inspector General of the State Department should review the department’s procedures for assigning country rankings in order to determine whether they are consistent with the TVPA and the methodology published in the TIP Report. This guidance should clarify if criteria other than those specified in the TVPA are used to determine a country’s tier assignment and, if so, what those criteria are and how they are applied. Technological tools that employ AIS and VMS satellite systems can aid officials in tracking, monitoring, and enforcing regulation of vessels participating in illegal activity, including human rights abuse. Technological advances that increase data collection on the high seas can be used by both governments and the private industry to effectively identify and take action against abuses at sea. Additionally, the U.S. State Department should include human rights abuse at sea in the development of the Safe Ocean Network, an initiative aimed at coordinating technology and internet-based tools relating to IUU fishing. Seafood slavery is not a problem that will be solved overnight—nor can one actor alone address its many causes and consequences. Putting an end to human rights abuses in the seafood industry and their ensuing effects on global fisheries will require a broad coalition of governmental, civil society, and private sector actors. The United States, as a global leader in the fight against human trafficking and IUU fishing, can play a catalyzing role in this effort. In order to do so, it must invest broadly in programs and initiatives that target the main drivers of seafood slavery, which in turn requires understanding seafood slavery as both a human trafficking challenge and a fisheries challenge. Advocates of sustainable seafood production and of fair treatment of workers have a shared interest in promoting legal fishing—legal not only with respect to the fish that are caught but also in terms of the workers who catch, process, and transport them. Trevor Sutton is a Senior Fellow with the National Security and International Policy team at the Center for American Progress. Avery Siciliano is a Research Associate on the Ocean Policy team at the Center. Jinny Lee Milani, an intern at the Center, contributed to this report.